Android is a device which is suitable for people of all ages. Parents can give an Android handheld device to their kids to play games sometimes. Kids always ask for their parents' devices as they love to play games. But the problem with this is that, Android games have paid versions or in-app purchase modes available. A child can easily click on some buttons to perform purchases on in-app items like tokens, credits, points, upgrades or hats. This issue is specially present in older versions of Android. These have known to cost parents tons of money, even thousands in some case. If you want to prevent such in-app purchases in your Android phone for kids then the easiest method is to not add credit card numbers or payment profiles to the phone that you hand out to the kids. Open up the Play Store in your phone. Click on More (the button that looks like three vertical dots) and then go to "Settings". You will be shown settings such as those regarding notifications and auto-updates. You will see a "User Controls" heading under which you can see "Content Filtering" and "Password" or "Require Pin" or something like that depending upon your Android make and version. 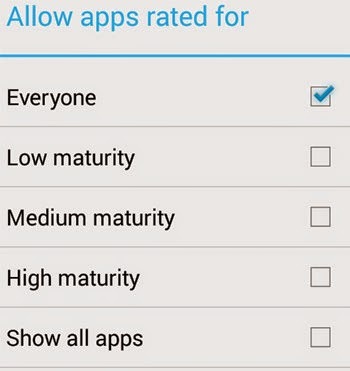 Go to Content Filtering and make sure that only "Everyone" option is checked, this will ensure that only the apps suitable for everyone is shown in the Play Store. However it is to be understood that anyone can change this option just like you did. In the second option under the "User Controls" heading, set up the password or pin. Turn up that option first (if not already using the check box besides it) and set the password/pin or Google account required to make purchases. Remember that kids are really clever and you should be quite careful as they might find ways to bypass security measures. Even if you have not added a payment profile, they might still get access to your card numbers and use it. So restricting purchases using password/pin is important even though you have not set up a payment profile.